When I go out to eat during the summer, I’m looking for something very different than any other time in the year. I can’t explain why, but something about the warm months makes me crave less gourmet meals and more fast food. Thankfully, Berks County has no shortage of home-grown restaurants offering an alternative to the Big Mac. A few weeks ago we traveled south on Route 222 to Boehringer’s. 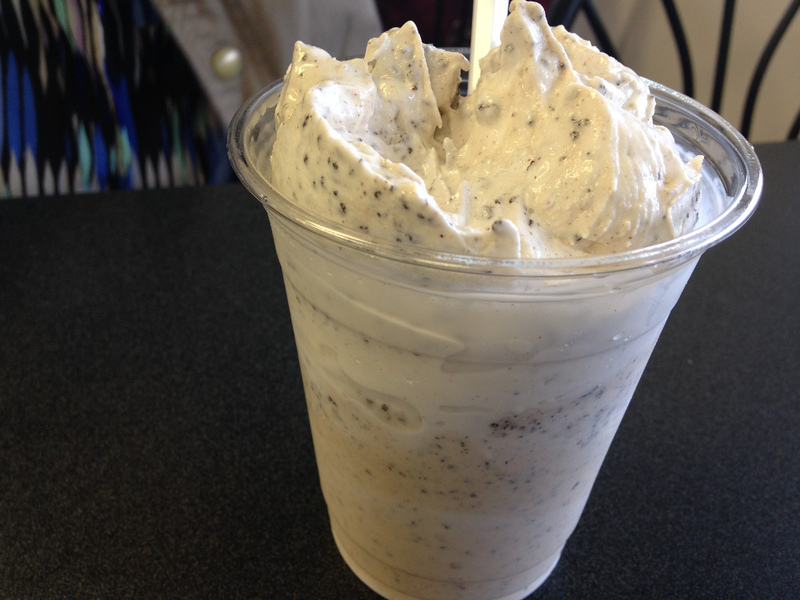 But a short drive in the other direction brings you to another summer-only spot where ice cream is king. 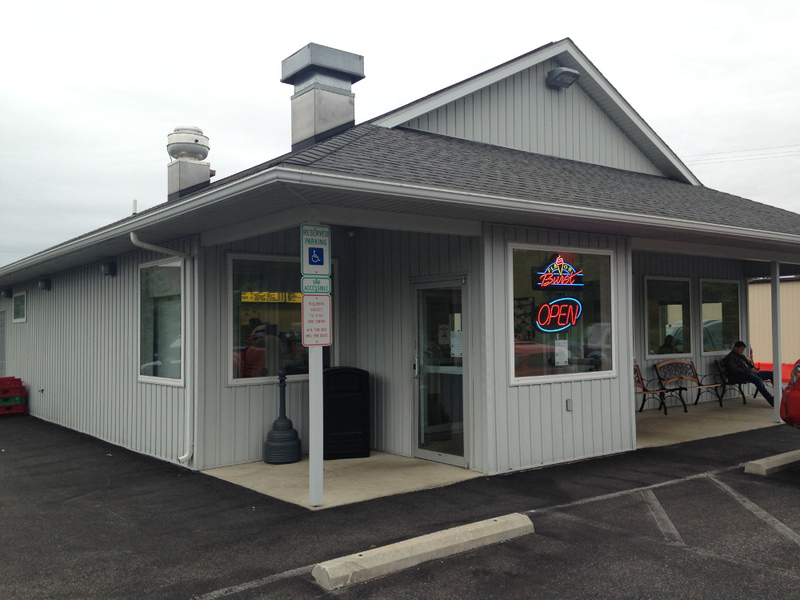 CeGee’s Drive-In sits on Fleetwood-Blandon Road, just a short piece from where the Route 222 bypass ends and the two-lane begins. This season marks the 11th for CeGee’s. For the first nine of those years, the parking lot would fill up on select Saturday nights for the popular restaurant, a tradition that ended last year with the arrival of a new retail store next door that took away the extra parking needed. Even without the cruise nights, the restaurant remains busy. When we arrived on a warm Saturday afternoon for lunch, most of the booths that lined that dining room were full with families. One difference between CeGee’s and similar restaurants that we’ve visited like Boehringer’s and Schell’s is that CeGee’s has a much larger food menu than the others. In addition to the staples like hamburgers, hot dogs and French fries, the menu includes cheesesteaks, chicken fingers, and a variety of sides like jalapeno poppers and pierogis. But when the sign outside proclaims “Coney Island,” there’s really only one option. 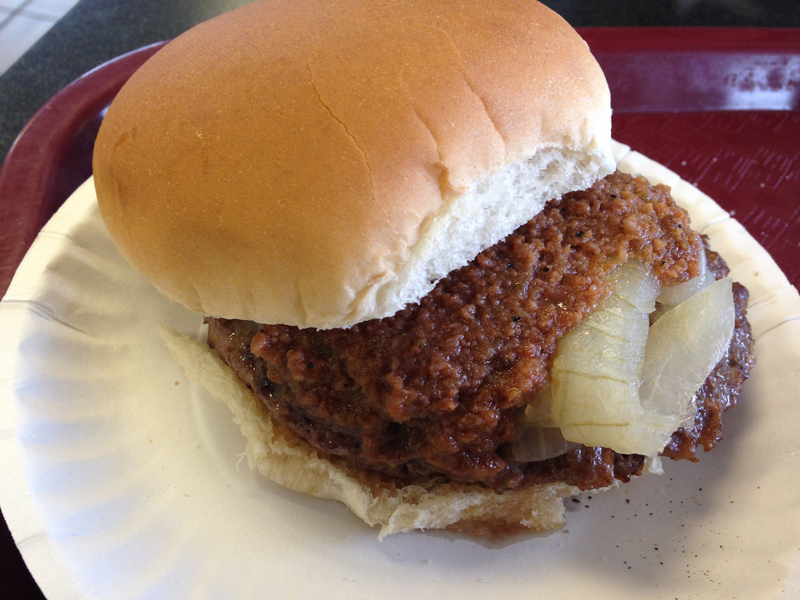 Coney Island hamburgers are a favorite of mine, but there are not a lot of places in Berks County to get one anymore. It’s a simple pleasure: a traditional hamburger patty covered in onions and Coney Island sauce, and CeGee’s does it really well. The sauce is somewhere between hamburger barbecue and chili with the meat ground really fine. It’s a just a little sweet, a great topper to a tasty burger. Julie also was hungry for a burger, ordering the bacon cheeseburger. 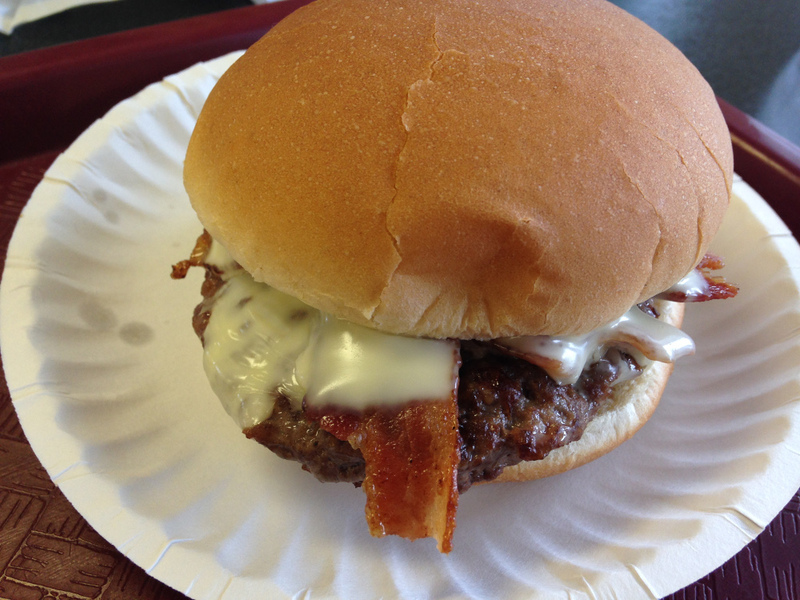 The American cheese was melted on top of the bacon, smothering everything for a delicious meal. 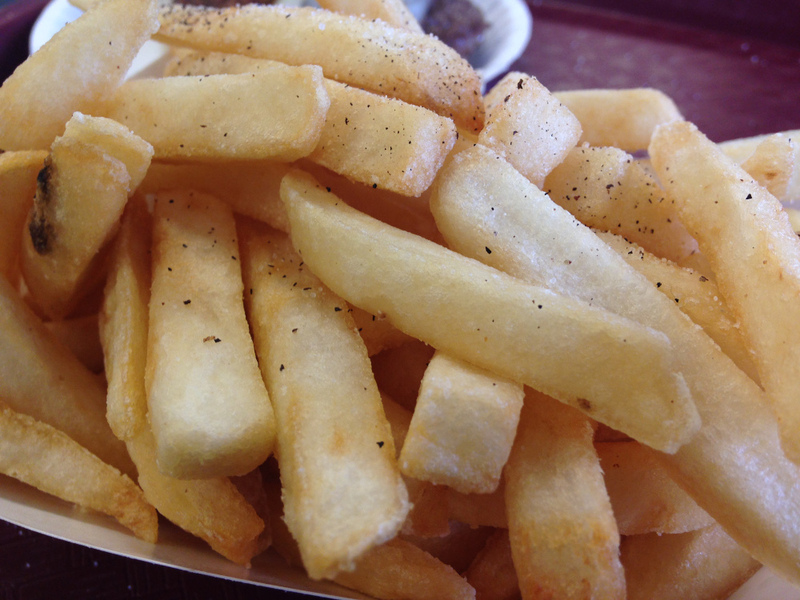 Planning ahead to dessert, we decided to split an order of fries. The thick cut spuds were good, but not unlike any other fast food joint. While the lunch and dinners are good, it is ice cream that is CeGee’s real bread and butter, so to speak. The soft serve only comes in two flavors—vanilla and chocolate—but those two flavors are just a starting point for flavor burst dips, a dozen different sundaes, countless milkshake flavors and nor’easters, CeGee’s version of the Blizzard. 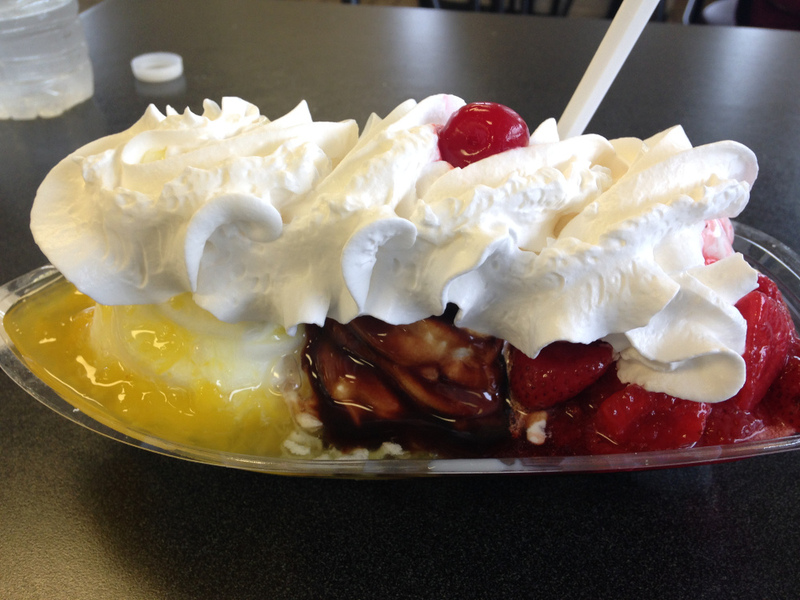 And then there’s the classic banana split which was just too tempting to resist. Three mounds of soft serve topped with pineapple, chocolate and strawberries, a load of whipped cream and the obligatory cherry on top, it was perfection in a plastic boat. A chocolate crunch nor’easter sounded good to Julie. Essentially cookies and cream, the vanilla soft serve was swirled with chocolate cookie bits. It’s impossible to go wrong with that flavor combination. Dessert almost cost as much as our meal, which says more about how reasonable the food prices are at CeGee’s. All told, we spent just over $20 during our visit. 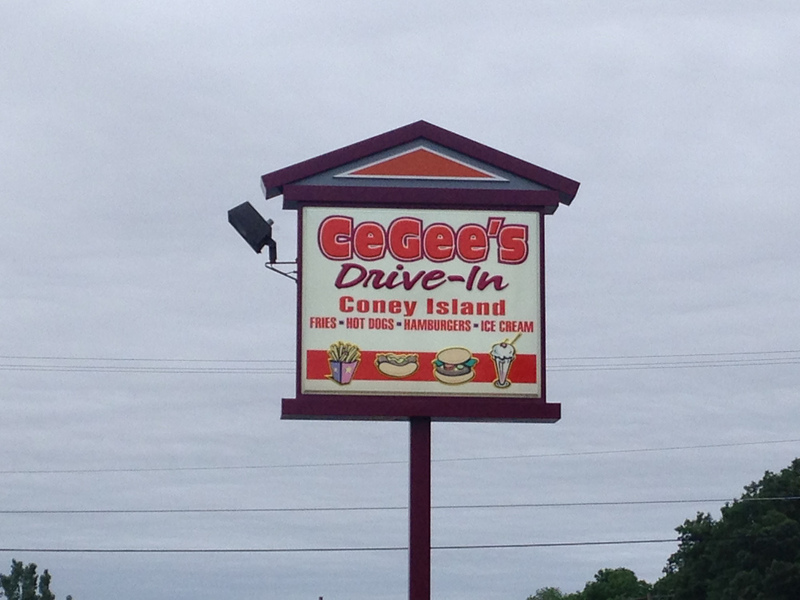 As with most of the summer drive-ins, there’s nothing fancy about CeGee’s. The food is good, the ice cream is fantastic, and there’s plenty of each to choose from. It was a great place to satisfy my fast food craving.